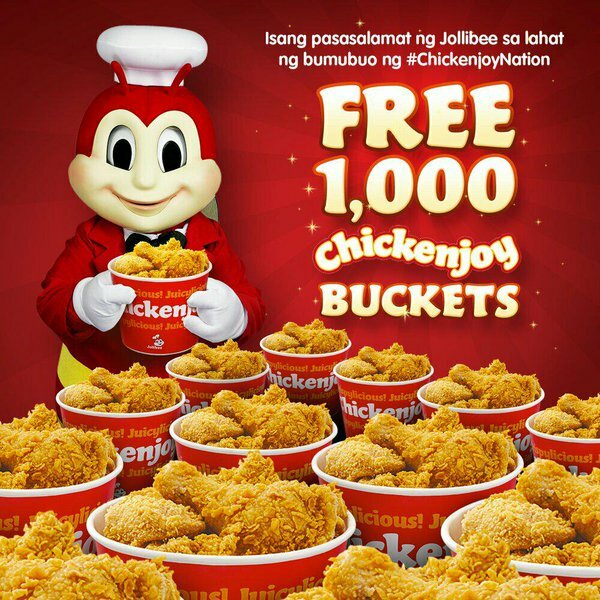 Jollibee "FREE 1,000 Chickenjoy Buckets" promo! how to win in Jollibee "FREE 1,000 Chickenjoy Buckets" promo? Jollibee thanks the #ChickenjoyNation w "FREE 1,000 Chickenjoy Buckets" promo! Visit our FB page for more details. The best 1,000 answers will get a direct message from us on how you can claim your FREE 6-pc. Chickenjoy buckets from May 1-7, 2016. Keep on sharing the taste and joy of the country's #1 fried chicken, Chickenjoy!